How Many Poops Does it Take to Create a Petty Dictator? Only a third-world backwater communist dictator would have ordered something like this. Kim Jong Un, North Korean dictator, butcher, and murderer of his own brother, has decreed that every able-bodied citizen must turn in 100 kg (220 pounds) of human feces a day to be used for fertilizer, to bolster the agricultural sector. Kim announced the poop scoop requirement in his New Year’s address saying that the agricultural front would be the primary instrument for economic reconstruction, according to an article published on Radio Free Asia (RAF) January 18. Quoting an anonymous source in North Hamgyong province, RFA’s Korean Service said, “After Kim Jong Un’s [speech], the entire population has been mobilized to produce manure as the first major task of the year The authorities in each local region task factories, institutions and citizens groups with assigning production quotas to each individual”. While the collection of human feces is a yearly task, high quotas this year are driving many to find interesting ways to collect human feces in the bitter cold, or to find ways to get out of their quota. Some however, are critical of the government, saying the high quotas amount to a shakedown of the people. “If you cannot fill the quota, you have to supply 300kg of compost or livestock manure instead,” the source added. “Most people can’t [make or collect] 100kg per day, so they end up giving what they think is sufficient. The quota is therefore meaningless,” said the source. There are, however, alternative ways for North Korean citizens to buy their way out of the potty pot. “Compared with last year, there’s a growing number of residents who are choosing to pay cash instead of providing the manure itself,” said the source. In addition to paying cash, citizens can buy manure from merchants. “The manure merchants are doing really well these days, charging 20 yuan (about $3) per 100kg of human feces or 300kg of compost,” the source said. “Young women who work in restaurants and beauty parlors usually just pay cash, though,” said the source. Another source, also in North Hamgyong province, said, “The residents of Chongjin City have been fully mobilized to fulfil this task. Authorities are encouraging people to produce more manure, stressing that it provides a vital boost to the agricultural front, and thereby the socialist movement in general,” the source said. “People are becoming increasingly dissatisfied though, as authorities are keeping production records for each person and putting pressure on those who haven’t produced enough [to fill their quota. ],” said the source. So, if one day’s pile of poop to equals 100 kg, how many piles of poop do you have to make before you have a Kim Jong Un? “In winter, there isn’t as much manure and compost. Cash payments exceed the value of the manure that actually ends up being delivered, so people are saying the regime is just using the quota as a means to collect more money from the citizens,” the source said. “More than 80% of all the female workers in Chongjin’s clothing factory pay cash instead of manure,” said the source. 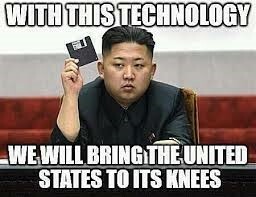 This entry was posted in Idiots, North Korea, Uncategorized. Bookmark the permalink. Has Monty Python’s Flying Circus returned? This is funny! And Fat Boy can certainly pony up—he’s the only obese person in the country!!! How can anyone produce 220 pounds of poop a day? Even if a person poops one pound of feces a day, there’s something wrong. The one exception is Kim Jong-Un: Imagine how much he must eat — and poop — to sustain his morbidly obese bulk. This is clearly insane, crazy making policy. Any halfway trained agricultural or agronomist person could have told the government this is not a sustainable goal, it should not even be thought of as realistic, but no one’s done that, out of fear, I guess. From a business point of view, Kim couldn’t even run a shoe shine stand to save his life with idiotic policies such as this! You have to eat in order to poop and from what I’ve heard, they are all starving in N Korea. So where is the poop going to come from. This reads like a piece from the Onion, not sure it isn’t satire. If true it doesn’t surprise me; the NK government is nothing if not progressive. Perhaps this could serve as a template for the kind of communist utopia the SJW’s say they want to bring to this country. Did they consider trying Brawndo on their plants and crops? They should squeeze the “Mao” out of him! A Potty Dictator! Bwhaha! Kind of hard for the comrades to poop for the collective when they are eating tree bark and grass. Forward!